The enchant discipline concerns imbuing physical items with magical properties called enchantments. The simplest enchantment are magical scrolls with a single enchantment that are destroyed with one use. The most complex enchantments are enchanted artifacts, objects with one or more magical effects powered by built-in soul gems. Skilled enchanters also use enchanted items more efficiently, with less waste of the magicka trapped in the soul gems. Enchanting is the process of permanently applying a magical effect to an item by harnessing the power of a creature's soul. This skill governs the creation, use, and recharging of enchanted items. Skilled enchanters are more likely to be successful at creating new items, their enchanted items use less power and are recharged more efficiently by soul gems. The Master Trainer for Enchant is Qorwynn in Indoranyon. Be aware that Qorwynn is hostile, and will attack you on sight. Using a calm spell and bribing him up to the point that he doesn't attack you anymore is the simplest way to receive training from him, but alternatively you can use 100% chameleon and he will happily speak to you. Unfortunately, there are very few other trainers of this skill, and none of them train to a particularly high level. See Enchant Trainers for the complete list. Enchanting items can be one of the most exciting - and powerful - features in the game. With the wide selection of spell effects and items to enchant, the possibilities are practically endless. Details on each of these items are below. The easiest way is simple: find the local Mages Guild or an enchanter. Although they have a 100% success rate, they charge an exorbitant amount of money to enchant with even the simplest of spells (for example, a simple Light 20 pts. for 30 secs. enchantment costs thousands of gold). They will notice if you ask them to enchant using a soul gem or an item you stole from them. Due to how the game defines "stolen", this really means any soul gem of the same type as one you have stolen from them. Stealing soulgems from a Mages Guild is particularly risky since they may have faction ownership, such that any Mages Guild enchanter will treat that soul gem type as stolen from them. Consequently, independent enchanters are safer for light-fingered characters to employ. The other method of enchanting requires no NPC – just drop a filled soul gem onto your character (like equipping it) to access the enchanting menu (you can recharge a magic item or enchant a new one this way). Using this method costs no gold, but there is a pretty high rate of failure, which will cause you to lose the soul gem in the process, though the item is not destroyed, fortunately. Even with a maxed out Enchant skill and Intelligence, you can only successfully enchant relatively low level powers (up to 30 enchant points with a moderately high failure rate). Using Alchemy or other magical means to boost Intelligence into the hundreds or thousands will allow you to attempt more complex enchantments. An Intelligence fortified to 4900 or an Enchant skill fortified to 1225 will be enough to guarantee the success of any enchantment. Enchanted items are basically an extra reservoir of Magicka. Enchanted items (other than projectiles) slowly recharge, even in city areas where you can't recover Magicka without accessing a bed, or around enemies where you aren't allowed to Rest. An item with a 1 point enchantment of Bound Weapon for 18 seconds will actually recharge that 1 point before the spell effect wears off, even with low Enchant skill. With a higher Enchant skill, you can use enchanted items more times before their charge is exhausted. Additionally, all enchanted items have a casting cost that is based on your Enchant skill, not your skill in the relevant spell school. For example, your Mysticism skill may be too low to predictably cast an Almsivi Intervention spell when you need one, but if you get an enchanted item with the spell, you can cast it without any skill in Mysticism whatsoever. Enchanted items never fail and have a zero casting time, so you can stack damage or healing effects faster than by casting spells, which have a short but noticeable cool down. Although you are limited to wearing only one amulet, two rings, etc. 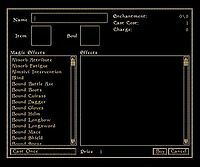 at a time, the game allows you to use almost any magical item that you have in your inventory by automatically equipping it for you when you use it by selecting it from the Magic menu (items appear in that list below spells). Overall, once your Enchant skill becomes high enough, you might never cast a spell again. You can also create Constant Effect items, such that merely equipping them gives you the effect(s), without needing to cast anything. Note that Items with constant-effect enchantments must be manually equipped. Thus, if you normally wear a helm that provides constant-effect Waterbreathing and auto-equip another helm that does Drain Magicka on Target by selecting this item from the Magic menu, you will need to drag your Waterbreathing helm back onto your character "paper doll" in the Inventory window to use its effect again. Items are either enchanted as Constant Effect or not; CE cannot be mixed with temporary effects on the same item. There is a possibility of confusion between a spell and a spell effect. For instance, the Hearth Heal spell you can buy (or start with if Restoration is one of your Major skills) has the spell effect Restore Health. Once you have this spell, or any other spell with the Restore Health effect, you can enchant and create spells using this effect (for any target type). Note that some effects have multiple types. For example, learning any Fortify Attribute spell gives you the ability to enchant an item which will fortify any of your eight attributes. If you buy a spell that increases Strength, you will be able to use that effect to create a spell or item to increase Endurance as well (you don't need to find eight different spells for all the attributes). The same applies to Absorb, Damage, Drain, and Restore Attribute effects, and also for Absorb, Damage, Drain, Fortify and Restore Skill effects. Enchant is Enchant skill level. Intelligence and Luck are the respective Attribute levels. Enchantment points is the number of points used by the enchantment, covered below. Effect is constant is 1 when the effect is constant and 0 when it is cast when used or strikes. This means the net enchantment difficulty (points combined with constancy, which doubles the difficulty) matters 2.5 times as much as Enchant skill, which matters 4 times as much as Intelligence, which matters 2 times as much as Luck. Even at maximum values for skill and both attributes, you'll be subtracting the enchantment's difficulty from 137.5, meaning you can only succeed 100% of the time with effects with a points cost of 15 or less, or 7 or less for Constant Effect enchantments. At first, you will only be able to make the most basic of enchanted items successfully. You should practice first by using or recharging already-enchanted items. Unfortunately, even if you've maxed your Enchant, Intelligence and Luck, the most advanced enchantments (such as Constant Effect) will still be out of reach for you. The only way to successfully create these higher end enchantments without paying large amounts of gold to professional enchanters is to use magical effects to artificially increase your Enchant, Intelligence, or Luck. The most effective way to do this is via Alchemy. You can also create an "enchanting suit", by creating items with Fortify Enchant, Intelligence, and/or Luck enchantments. You'll have to start with "Cast when Used" items, and with relatively low values, but if you keep at it, you'll be able to gradually build up a better and better Enchanting Suit, since each piece will increase your ability to make better pieces. (You can sell the weaker pieces that you're not using anymore.) Eventually, you can build a full suit of Fortify Intelligence clothing at the highest strength available, or even with Constant Effect enchantments (see below). From then on, simply wearing the suit whenever enchanting things will give you enough of a boost to create high level enchantments. (However, you still may have less than a 100% chance of succeeding.) Remember the relative weights above: boosting your skill is more effective than boosting your intelligence by a factor of 4 or your luck by a factor of 8, and boosting your intelligence is more effective than boosting your luck by a factor of 2. If you have the Tribunal expansion, you can buy Fortify Skill spells from Nerile Andaren in the Mournhold Temple's Halls of Ministry and from Laurina Maria in the Imperial Cult Services in the Royal Palace. With Bloodmoon installed you can also buy them from Bronrod the Roarer in the Skaal Village on Solstheim. In order to enchant an item, you will need a filled soul gem, which you can buy from enchanters (see above) or fill yourself. You will need plenty of souls if you wish to effectively train your Enchant skill. To acquire a soul, you must cast a Soultrap spell (or use an item that applies its effect) on a creature before you kill it. You must have an empty soul gem large enough to contain the creature's soul in your inventory. You must kill the creature before the duration of the spell effect finishes. More powerful creatures hold larger souls which can be used to create greater enchantments, and require higher-quality soul gems. It's a good idea to match the size of the gem to the strength of the creature's soul. For instance, trapping a Nix-Hound's soul (10) in a Grand Soul Gem (whose maximum capacity is 600) is a waste of an uncommon and powerful soul gem which could be used to trap much more powerful souls. Carefully maintain your soul gem inventory so you do not waste any souls or gems in this way. If you have multiple empty soul gems of differing sizes in your inventory, the soul will go into the smallest one whose maximum capacity is equal to or greater than the value of that creature's soul. For a list of soul gems and their maximum capacities, see below. A list of Morrowind soul sizes can be found here, Tribunal sizes here, and Bloodmoon here. One of the quickest and easiest methods is to simply obtain a magical item or spell that summons a creature for you as well as an item (especially a weapon you can switch to, which is faster than spellcasting) that applies the Soultrap effect on touch or target. Summoned creatures can be soultrapped just like regular ones. Once you have these items, it's a simple matter to Summon, Soultrap, kill, and repeat as often as you need. The school of Conjuration contains many spells which summon powerful creatures, such as Golden Saints, who produce excellent souls (though they may also try to Dispel the Soultrap effect, so it is best applied just before the final blow). Additionally, summoned creatures regard your first few attacks on them as unintentional, so they pose much less of a threat than the same creatures found elsewhere. Items enchanted with Summon and Soultrap spells can be made relatively cheaply by an Enchanter, and you can often find Summon- and Soultrap-casting items in the world. Alternatively, many enchanters will sell already-filled soul gems, though rarely of the best quality. When you are a strapped for gold, you can sell soul gems you have filled but do not need, for much more than the cost of the empty soul gems (which you may have found as loot anyway). You can only create an item with Constant Effect (CE) enchantment if the size of the soul in the gem is 400 or greater. This means that only a few creatures, in a Grand Soul Gem or Azura's Star, provide souls large enough to create CE enchantments. These are: Golden Saints (and Staada, a unique Golden Saint), Ascended Sleepers, Dahrk Mezalf (a unique Dwarven Spectre in Bthungthumz), and the Tribunal gods, Vivec and Almalexia (in Tribunal). 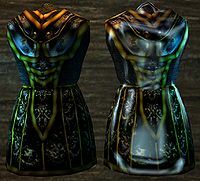 Large and rare souls, such as those of Almalexia or Vivec, shouldn't be used in CE enchantments, because their extra charge cannot be put to use. This is because the item being enchanted is the limiting factor to a constant-effect enchantment, not the charge of the soul that is being used, so long as the soul qualifies for CE enchanting at all. Enchanting a Daedric Tower Shield (the item with the highest enchanting points) with a CE enchantment will have the same limitations if a Golden Saint's soul or Almalexia's soul is used. With other kinds of enchantments, these rare souls' high charge can be put to use. Thus, only 400-charge souls, the minimum for CE, should be used to make CE items. Fortunately, you can summon Golden Saints (check the Mages Guild in Caldera for scrolls if you are a member of the guild and have a sufficient rank - or buy the spell from Felen Maryon in Tel Branora, who is the only vendor anywhere who sells it), and enchant an item with the ability to summon them so the number of constant-effect items you can have is limited only by the number of Grand Soul Gems you can find. Note that the Tribunal expansion adds a vendor in Mournhold that restocks Grand soul gems. Alternatively, you can use Azura's Star, which can be used infinitely. where the base cost is the minimal cost for each spell (see Spell Effects for the base cost). A maximum of eight effects can be added to an item, but creating each additional spell will increase the cost of the prior enchantments in the list (see Compounding Effects below). Almost any equippable item may be enchanted, provided it is not already enchanted, of course. Certain item types are more suitable for carrying more powerful enchantments than others; equippable items each have an enchantment capacity from 0 to 225, most often in the 1–20 range. Magic effects to be added as enchantments have an enchanting cost of 1 or more of these points, often much more. Some spell effects have been made impossible for the player to enchant into items, by having been given enchantment costs that exceed the 225-point capacity of the most enchantable item (the Daedric Tower Shield). In addition to enchantment cost, all non-constant-effect enchantments have a casting cost, taken from the item's soul charge, which slowly replenishes over time (as long as the item is in inventory), or can be more rapidly recharged with soul gems (with a non-zero chance of failure which decreases with increased Enchant skill and Luck attribute). Cast When Used enchantments can be applied to any equippable item, and only trigger when you select the item from the Spells menu (enchanted items are listed below actual spells), and cast its effect(s) as if casting a spell. As with scrolls, item casting is instant and does not have a spellcasting animation display. It is important to realize that a cast-when-used weapon does not cast its effect when you attack with it, and cast-when-used armor doesn't trigger its effects when struck. Each use consumes some amount of the item's charge, and each effect may be on self, touch, or target. Cast When Strikes enchantments apply only to weapons (other than bows or crossbows), as detailed below. Each use consumes some amount of the item's charge, and each effect may be on self, touch, or target. Strike enchantments can be combined with when-used enchantments in the same item. Constant Effect enchantments operate continuously, and can be applied to any equippable item. Items with CE enchantments do not have charges, and CE cannot be mixed with either of the "cast when" types. Only on-self effects can be enchanted as constant, though not all of them are immediately intuitive. For example, you can do Summon Flame Atronach as a CE effect; it does not keep resummoning atronachs constantly, but retains the same summon until it dies (and then summons another) or until you unequip the item. See above for general info on producing CE enchantments, and below for tips about using CE effectively. The best weapon in terms of enchanting is the Ebony Staff, which has 90 enchantment points, more than four times the enchanting power of the next highest staff. Like most staves, it deals rather low damage, but it can carry a devastating amount of enchanted offensives — for example, if you give it Fire (or Frost), When Strikes, 1-65 Points, for 11 seconds, that's a total of 14-731 damage (with the 3-16 Slash, and it will have 400 Charges). Ebony Scimitars from Tribunal have an astounding 80 enchantment points, only somewhat lower than the ebony staff, while still being excellent one-handed swords in their own right, comparable to Daedric one-handed swords. This allows one to use a high-power, high enchantment weapon along with a Daedric Tower Shield, which is the most protective base shield and the best item for enchanting. The Daedric Claymore and Daedric Dai-katana also have a viable balance between weapon damage and enchantability. Daedric weapons hold the top spots for most other weapon classes as well, the one other exception being Bows. Surprisingly, the relatively common Bonemold Long Bow has almost twice the enchantment value of the incredibly rare Daedric Long Bow. One note for enchanting bows and crossbows, however: while it is possible to choose "Cast when Strike" for an enchantment on a bow, this will actually be completely useless, because you don't actually strike anything with a bow or crossbow, but with the missile if fires. Thus, you should choose either "Cast when Used" or "Constant Effect" enchantments when enchanting bows and crossbows. Ammunition such as arrows and bolts cannot be enchanted. [verification needed — see talk page] (This bug is fixed in OpenMW.) However, you can find already-enchanted versions of these for sale and when adventuring. Thrown projectiles like stars and darts can be enchanted one at a time, but they lose their stackability in the process, so you will have to constantly re-equip them when you fight with them. For this reason, and because stacks of pre-enchanted ones are common in the game, enchanting them manually is best reserved for special purposes. An exploit example: you can enchant Carved Ebony Darts with magnitude 1-1, duration 19 Bound Armor+Calm Humanoid on Touch spells to steal armor pieces from NPCs without killing them, provided the game has not been modified to fix the bug where Calm magnitudes don't matter. You can hit an NPC, and attempt to pickpocket the item they de-equipped in favor of the Bound one. A more realistic example is using a short-term Soul Trap with a maximum area of effect, to flush enemies out of areas in which many may be lurking (though humanoids cannot be soul trapped, they react to the effect as a hostile spell), and get them to make a direct bee-line for the PC, often clustering enough for an area-effect attack to hit them all. "Touch" is calculated relative to the PC, not the weapon, and has a reach of 1. With "Cast When Strikes", the enchantment will be fired when the weapon connects, but the enemy has to be within Touch range for the effect to hit them. [verification needed — see talk page] (This bug is fixed in OpenMW.) To take advantage of the greater reach of spears and some staves and hammers, a Target, not Touch, effect should be used, although this will multiply the enchantment points cost by 1.5, meaning the effect's effective ((min+max)/2) magnitude has to be reduced to 2/3 to maintain its cost, assuming it has area 0. This restriction does not apply to arrows, bolts, or thrown projectiles. Armor types have a wide range of enchantability, based on both the material and the type of armor. Shields offer the best potential for enchantment by far, and remember you can still equip a shield even with a two-handed weapon. The Daedric Tower Shield is hard to find but has 225 points to enchant which is the largest of any item. Helmets are next, the best being the Telvanni Cephalopod Helm, which seems specifically made for the purpose. However, it is not very effective in terms of defense. The three Daedric helms are the next best, and far superior at protecting your head. Cuirasses and Gauntlets/Bracers are next, followed by Boots, with Greaves and Pauldrons being by far the worst. (A notable exception being the Adamantium Right Pauldron added by Tribunal or the Adamantium Armor plugin.) One thing to be careful of is to never enchant any armor piece with a Constant Effect Bound Armor which replaces itself (e.g. a helmet with Bound Helm), as this will cause problems, such as a permanent bound item in inventory that cannot be dropped or even repaired. Jewelry is the best class of non-armor clothing to use for enchanting, exceeded only by shields for their ability to hold enchantments. Rings and Amulets also have the advantage of being both very enchantable and very lightweight, unlike shields, so you'll probably want to carry a bunch of different enchanted jewelry items for use in different situations. Pants, Shirts, and Skirts are the next best. You can wear all three at once (regardless of gender), so they can be combined for the most effects. Robes, Belts, and Shoes are next, Gloves being the worst. Shoes and gloves are not the best to use generally, since they cannot be worn along with boots and gauntlets/bracers. You can easily tell the quality of most pieces of clothing simply by the name. Exquisite-quality clothing items are the best, followed by Extravagant, Expensive, and Common, in descending order. (Gloves do not have an "Exquisite" version, so Extravagant Gloves are the best you can get.) One downside is that while there are many varieties of Common and Expensive clothing, there are fewer for Extravagant, and only one each for Exquisite, so any two characters wearing the best-quality clothing look pretty much the same. Most clothing without these quality-indicating names (e.g. the Gondolier Shirt) are around Common quality, though there are exceptions, mostly unique items that are quest-related or pertain to particular NPCs. Ci is what each effect would cost if it were the only one in the enchantment. More simply, every time you add an effect to an enchantment, the base cost of each effect already present is multiplied by the number of effects below it in the list (plus once more for itself). Even more simply, if an enchantment has 3 effects, the first effect's cost is 3 times what it would cost by itself, the second effect costs twice as much as it would alone, and the last one's cost is unchanged. A side effect of this is that the total enchantment cost can vary with the order in which you add the effects. The bottom line? Put in the small effects first. Play around with the effect you really want, then if you have enchantment points left over, start over with some effect that uses up half of the remaining points, then put your original effect back. For items that already have two effects, choose an additional effect that uses half of the remaining space; use one-quarter for three effects, etc. If you don't get it right the first time you can, fortunately, adjust the strength of the effects without redoing the whole enchantment. It may not seem like much, but every little bit counts. In particular, multiple items with low-magnitude Light as a constant effect, and Levitate as cast when used, are helpful. If you equip it for the first time and the effect is only 16 points or so, you can unequip and then re-equip it repeatedly until the fortitude is at least in the high 50s. With higher Luck, it will take less time. This way, you can make enchantments with higher maximum magnitudes, for the cost of having to equip it a few times before you get it to apply a magnitude higher than the median value. This can have an annoyance factor, particularly with less durable armor, as you'll have to repeat the process every time your armor is broken and repaired. Thus, it's best to use this on either very durable armor and make sure to keep it in good repair, or to use it on clothing, which is indestructible. Also, it's best to use it on items you're not likely to want to change regularly. If you have a large collection of enchanted rings and amulets for different situations, you probably don't want to use jewelry for this, or you could spend half your time just constantly re-equipping items to get the best magnitude of effect out of them. Using a shield for a Strength fortification is safe; despite the fact that you can't literally hold it up while casting a spell or wielding a two-handed weapon, the game does not unequip it when you do so. This form of enchantment is also undermined by Morrowind's attribute/skill calculation; if a stat is Damaged (not Drained), it cannot be restored until you unequip all items fortifying that stat. This bug is fixed in OpenMW. If using the maximum number of enchanted items, (cuirass, greaves, glove/gauntlet/bracer 1, glove/gauntlet/bracer 2, pauldron 1, pauldron 2, helm, pants, skirt, shirt, robe, amulet, ring 1, ring 2, shield) this can become very tedious. For example, every Greater Bonewalker can damage Strength, which is typically one of the most-used stats for Constant Effect buffs. The Restore enchantments (Restore Health, Restore Fatigue, etc.) are handled differently from other constant-effect enchantments and are not as predictable when provided a magnitude range. These magicks, if applied as a Constant Effect, will actually cast the effect on a character once per second and choose a different magnitude from the given range each time. If a ring is enchanted to Restore Health 4pts constantly, then it will apply the effect of Restore Health 4pts to the equipped character and they would heal by 4 health per second. If the same ring were enchanted to Restore Health 1-10pts constantly, then at the same interval it will apply the Restore Health 1-10pts effect which will choose a different magnitude each time it is applied, and the equipping character might heal by 4 health, then 1, then 3, then 9, in successive seconds. Repeatedly checking the magnitude of the Restore Health effect applied to a player character by the enchanted item will show different magnitudes without re-equipping the item. Over time, a CE Restore item with a range will average out to at least a slightly better benefit than one with a fixed enchantment in the center of that range, as long as the player character's Luck is over 50. There are problems with some constant-effect enchantments. Constant Levitate prevents you from sleeping anywhere besides beds/bedrolls/hammocks. Constant Water Walking makes it impossible to go underwater, which is required to get to certain areas or find certain items. Constant Water Breathing will cause problems for a certain quest for the Tribunal Temple, as will Constant Restore Health. * Azura's Star is a special Soul Gem, given as a reward for Azura's Quest, and is fully described on the Azura's Star article. Unlike other Soul Gems, it will not be destroyed after using, so you can use it again and again. This list contains some locations in the game where you can find Grand Soul Gems. Unfortunately, a good number of places where you find them are random (such as crates in Smuggler's Caves). One trick that helps with random loot is to know that the random items in a crate or barrel in a bandit cave are re-assigned every time you leave the cell and re-enter, provided that you've taken nothing out of that container yet (and it actually contains random loot, not special items, and not just ingredients). To get loads of Grand Soul Gems, or Skooma bottles, or whatever random loot you happen to be after, it is merely a matter of entering the cave, finding and taking the Grand Soul Gems out of the crates that have them, and then exiting the cave. The easiest and fastest way to do this is to cast Mark just outside the cave, loot the Grand Soul Gems, cast Recall back to your Mark, and re-enter the cave. When you return, any random-loot container you didn't take stuff out of will have new stuff in it, and sometimes they'll have Grand Soul Gems that they didn't have before. To avoid wasting your time checking in a container you've already taken something out of, it helps to set something useless, like a bottle of Greef, on top to mark it. Balen Andrano is the only vendor in the base game who sells just 1 empty Grand Soul Gem. The Tribunal expansion alleviates the issue by introducing Elbert Nermarc, a vendor who restocks 5 empty Grand Soul Gems and can increase stock. Do not enchant a Bound Item spell with Constant Effect on the same type of item (Bound Helm on a Helm for example). This will crash the game. Likewise, do not combine multiple Bound Items in such a way that they will cancel each other out, e.g. : Bound Helm on a Cuirass and Bound Cuirass on a Helm. If you wear both items at once, it will crash the game. Another problem with constant-effect Bound Item enchantments is that Bound Items will take damage just like any other items, and they can be repaired just like any other items as well. If you repair any Bound Item (either by yourself or at a Smithy), you may end up with permanent copies of your Bound Item cluttering up your inventory. (This is a problem for non-constant-effect Bound Items as well, but generally those are more likely to expire before you do any repairs, so the issue doesn't come up as often as with Constant Effect enchantments.) See the note on the Bound Items page for instructions on how to remove these items. While using a constant-effect Bound Item, simply take off the enchanted item that gives you the Bound Item and then re-equip it. This will cause the damaged Bound Item to disappear and be replaced with a new one. Constant-effect Bound Items also glitch a lot when you enter menu mode (right click) then un-equip and re-equip them without leaving menu mode in between. Sometimes they even glitch when you do leave menu mode between un- and re- equipping. These glitches mainly consist of keeping one or more bound items when the effect is removed. This can be solved by fully repairing the bound items and then using the Console command player->RemoveItem "item_ID" x, where x is the amount of excess items. Repairing the items beforehand is required, otherwise the game will crash. Though you can simply take off the offending item, if you used the glitch to get that constant effect, you may have problems. There's a bug in the original unpatched version of the game. If you select an 80k or higher soul gem, select Constant Effect, and then switch to a lower-quality soul gem, the constant effect remains. This bug was, however, fixed in a patch for both PC and Xbox, and is not present in the most recent version of the game. There are also some problems with multiple enchantments. For example, if you make an amulet that casts a 100 Open spell at a distance and Telekinesis, you may end up with a permanent, unlimited-range telekinesis ability. This may have been fixed with later patches, however. When enchanting items with Fortify Attribute or Fortify Skill, enchantments set to a duration of 1 will occasionally fail to fortify the skill/attribute, but will play the correct sound and display the correct particles. To prevent this, set the duration to something other than 1 and then change it back again, before creating the item (assuming you really need an item with exactly a 1 second effect). If you cast multiple Soultrap effects on a single creature (not the same spell more than once, but multiple different spells and/or effects from items), and they are all active when the creature is killed, you can receive as many souls from a single creature as the number of Soultrap effects currently active on it, provided you have enough soul gems of sufficient capacity to hold them all. In some unpatched versions of the game, you can cast Soultrap on a corpse to get as many souls as you want. This bug was, however, fixed in a patch, and is not present in the most recent version. If you have a constant effect Fortify Skill to increase your enchanting to 110 or more, all activations of charged items cost only 1 charge, regardless of the effect. This page was last modified on 13 April 2019, at 06:42.